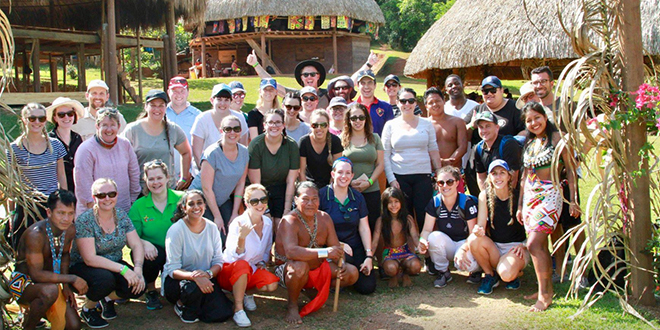 Brisbane pilgrims: Brisbane Catholic Education pilgrims visit and meet with indigenous Panamanian villagers, called the Embera people. PILGRIMS from the Sunshine State have gathered in droves and entered Panama City to celebrate World Youth Day 2019 with Pope Francis and hundreds of thousands of Catholics from around the globe. WYD 2019, which ran from January 22 to 27 (today), was the 16th World Youth Day since its inception in 1984. While journeying to Panama City, pilgrims representing Brisbane Catholic Education joined up with pilgrims from Cairns and Rockhampton Catholic Education. BCE pilgrimage co-ordinator Steph Unger said the pilgrimage was a unique opportunity for the young pilgrims to grow stronger in their Catholic faith. “It’s far more significant than just participating in the extraordinary, hard-to-describe, epic phenomenon that was World Youth Day,” she said. “Rather, it’s a lived response to God’s call for us, in our lives, at this time. Ms Unger and fellow pilgrimage co-ordinator Stephen Long said the main goal of WYD was to let youth know about the message of Jesus Christ in the context of a joyful meeting with the pope, other young people from around the world and leaders of the Church. Ms Unger said some of the pilgrims may be drawn to experiencing WYD through the lens of Pope Francis’ encyclical Laudato Si’– On Care For Our Common Home and in light of the breathtaking biodiversity backdrop that can only be experienced in Panama. She said, for others, it might be an opportunity to connect with, and be inspired by, Mary and her courageous “yes” to God. “To others, this pilgrimage might provide the first opportunity to encounter Jesus in a real and tangible way, opening the door to a deeper more personal relationship with Christ,” she said. Cairns Catholic Education identity and outreach director Sharon O’Keeffe said in a reflection that, because of the secular nature of Australian society, events like WYD were all the more important to be involved in. She said she was excited to see the impact WYD had on the young people with whom she was travelling. “The joy of listening to personal testimony, being enriched and challenged through daily catechesis, singing hymns as we walk in communion as one family of Christ on a pilgrimage walk is difficult for the uninitiated to comprehend and even more challenging for the pilgrims themselves to articulate,” she said. “For me, when people ask the ‘so what’ of World Youth Days, I often refer back to the founder of WYD – Pope John Paul II. “(St John Paul II was) acutely aware of the personal challenges to faith that many of our young believers experience, with some youth even turning their back on a faith they may not yet understand. As the festivities were getting underway, one story was generating a lot of buzz – or a lack thereof. Power outages struck Panama on the days leading up to the arrival of Pope Francis. Traffic lights were out, stores were left in darkness and petrol stations couldn’t pump fuel. Although the power came back on and the Panama President Juan Carlos Varela said it was fully re-established, the outage highlighted the struggling conditions of the small Central American country. About 20 per cent of the country lives in poverty, according to the University of Oxford, and many of those who have escaped poverty are vulnerable to falling back into it. This will, no doubt, be on the minds and in the camera lenses of all those attending WYD 2019. Other stories surfaced of a Mexican pilgrim group which was left stranded after group members bought their tickets and pilgrimage packages, only to find they had been swindled. About 400 pilgrims from at least 11 dioceses bought tour packages from a company known as JCP Multimedios. The packages included airline tickets, accommodation, registration for the event and a pilgrimage kit, according to a January 15 statement signed by Auxiliary Bishop Juan Armando Perez Talamantes of Monterrey, head of the Mexican bishops’ youth ministry. Some of the pilgrims learned of the apparent fraud after arriving at the Mexico City international airport to take flights to Panama City – and some had remained stranded there, the statement said. But, these days, you don’t need to be in Panama to be part of WYD. Twitter accounts such as @WYD_en and applications on smart phones have been able to keep many far-away Catholics involved in the celebrations and the prayer life of the festival.